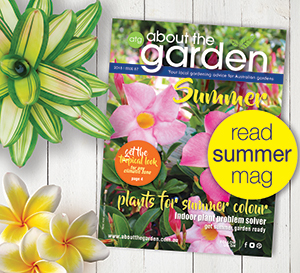 Growing points for growing gardens. This is our new Loyalty program which supersedes the previous Plants Plus Rewards Program. By joining our Grow Card Loyalty Programme you will benefit when you purchase plants, pots and other selected items. Points can be redeemed against future purchases to help you grow your garden. Points will not be earned on landscape products, bulk products, pavers, hay, sandstone, turf, or coffee hub – see list below. No Grow Card points will be earned on the purchase or redemption of Gift Vouchers. Points will not be earned on any products already on a promotion discount. There is no joining fee. Points will be valid for 12 months. Grow Points cannot be earned when points are being redeemed. Points balances cannot exceed $1,000. Participation in the Grow Card Loyalty Programme means acceptance of its Terms and Conditions. Items which do not earn Grow Points include turf; bulk soils, sands, stones, mulches; all landscaping products – timber, rocks, sandstone, pavers etc. ; hay; cement products; garden services and delivery fees; coffee hub; gift cards; any item already discounted; and any other stock which may from time to time be excluded. 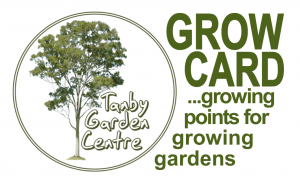 Tanby Garden Centre – The Capricorn Coast Nursery and Landscaping Destination. Servicing Yeppoon, Emu Park, Rockhampton and surrounding areas.